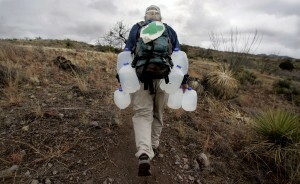 – No More Deaths volunteers Steve Johnston and Peter Ragan walk briskly down a switchback trail with two plastic water jugs in each hand. The men carry several more jugs inside their backpacks, and others hang from carabiners. When they reach a wash at the bottom of the hill, they set the jugs down in a bunch. On this cold and wet January day, Johnson, Ragan and Ayala Rahm leave 79 water jugs at six known illegal-immigrant trails southeast of Arivaca. These 1-gallon plastic jugs are at the root of an ongoing and sometimes antagonistic standoff between Southern Arizona humanitarian groups and Buenos Aires National Wildlife Refuge officials. Refuge officials have issued littering tickets to 15 volunteers from No More Deaths, Samaritans and Humane Borders over the last two years for putting out jugs on refuge land. Two have been convicted in federal court and 13 are scheduled for trial in April. In a refuge already considered one of the most imperiled in the country because of the damage done by illegal border crossers and Border Patrol agents chasing them, refuge manager Mike Hawkes says he’ll allow members of the group to put out water only if they use 5-gallon or larger jugs chained to trees at set locations. Humanitarians say the water jugs save lives in the desert, where more than 1,500 illegal crossers have been found dead over the last decade. As their posters say, members of No More Deaths believe humanitarian aid is never a crime. Members are fundamentally against restrictions on their work, and say the littering charges are a smokescreen to keep water from those who need it. Debates about the merits of leaving water in the desert are nothing new in Arizona, but the level of acrimony in this dispute is. The two sides have met three times in six months and exchanged several letters, but they haven’t been able to reach an agreement. Cowan, a member of the negotiating committee representing No More Deaths and Samaritans, is optimistic the issue will be resolved in time to avoid the April trial scheduled for the 13 people cited in July. The trial already has been pushed back twice. But Hawkes, who became refuge manager in September 2008 after spending six years at the Kauai National Wildlife Refuge Complex in Hawaii, isn’t so sure. The accusation is one of several scathing opinions Hawkes has about the humanitarian groups. He calls No More Deaths an anti-government organization whose goal is to make sure every illegal border crosser has a safe and comfortable trip. Members want to leave water in the refuge – as opposed to other areas with more deaths – because the refuge is close and convenient from Tucson and Green Valley, he said. Hawkes points out that only two bodies were found in the refuge in fiscal 2009. He said the refuge is doing enough to keep illegal border crossers safe by coordinating with Border Patrol agents and with the placement of Border Patrol rescue beacons and Humane Borders water tanks. He also said there are plenty of water sources within the refuge, including cow tanks. Cowan and fellow negotiating team member Gene Lefebvre said the group is trying to avoid demonizing Hawkes, but they disagree with many of his claims. There’s not as much water in the refuge as he says, they maintain. Many of the wells he points out no longer work, they say, and the cow tanks are so dirty the water would make a person sick. The bodies of seven border crossers have been found within the refuge since 2007, Hawkes said. But hundreds have been found in the last decade in the Altar Valley, where the refuge is located, the Arizona Daily Star’s border death database shows. Last year was particularly deadly in the Border Patrol’s Tucson Sector, which covers New Mexico to Yuma County. The bodies of 213 illegal border crossers were discovered in fiscal 2009, the third-deadliest year ever. Cowan and Lefebvre call it disingenuous for Hawkes to cite litter as the reason for his opposition. Group members pick up trash during patrols and recycle jugs they find. The group offered to pick up twice the trash it leaves in exchange for being able to put out water, but Hawkes rejected the idea. “If they really cared about the trash, they would snap at the idea of hundreds, perhaps even thousands of people, every year volunteering through No More Deaths to pick up trash,” Cowan said. Department of Interior Secretary Ken Salazar, who met with No More Deaths representatives last summer, recognizes the urgent need to find a solution that will allow the group to continue its work while complying with federal laws, press secretary Kendra Barkoff said in an e-mail. When humanitarians meet later this month with Hawkes and refuge officials, the negotiations will likely turn to the size of the jugs. Members of No More Deaths don’t like the 5-gallon idea because they say most border crossers dump their jugs when empty, meaning they wouldn’t have jugs to refill when they reach the water station, Cowan said. The group leaves out 1-gallon jugs so people can carry water north. That’s exactly Hawkes’ concern: The No More Deaths jugs compound the jugs already left by illegal immigrants. He believes the 5-gallon solution would greatly reduce the trash. That’s why he rejected a permit application from humanitarians in October that asked to set out 1-gallon jugs. Meanwhile, No More Deaths members say they’ll keep leaving water in the refuge. Hawkes says they’ll be ticketed if caught. A look at humanitarian groups’ standoff with officials at Buenos Aires National Wildlife Refuge. • Summer 2007: No More Deaths and Samaritans begin leaving water in the refuge. • Feb. 22, 2008: Dan Millis is cited for littering. • September 2008: Mike Hawkes becomes refuge manager. • Sept. 22 2008: Millis is convicted of littering but gets a suspended sentence. • Dec. 4, 2008: Walt Staton is cited for littering. • June 3, 2009: Staton is found guilty of knowingly littering in a national wildlife refuge. • July 9, 2009: Upset that Hawkes doesn’t agree to a meeting, volunteers from No More Deaths, Samaritans and Humane Borders protest by leaving water in the refuge. Thirteen people are cited for littering. • Aug. 11, 2009: Staton is sentenced to one year of unsupervised probation. • March 2, 2010: The 9th U.S. Circuit Court of Appeals is scheduled to hear arguments in Millis’ appeal. • April 6, 2010: Trials are scheduled to begin for the 13 people cited in July 2009. The only logical conclusion is that the nation whose troops now are occupying this other country had another agenda in mind that it didn't want to share.